The following are excerpts from the book on "San Damiano Messages" published by the San Damiano Ctr, Natick, MA. On September 29th, 1961, the feast day of St Michael the Archangel, the Madonna (Mother of Jesus) visited the Quattrini home and cured Mamma Rosa Quattrini whom the local doctors had sent home to die, as her condition had been considered "hopeless." After touching Rosa and curing her, the Madonna directed her to go to see Padre Pio, who instructed her over a two-year period in the spiritual and physical care of the sick. When her Aunt Adele became ill, she again sought Padre Pio's counsel who told her to return to San Damiano to care for her aunt and to await a great mission. A short time later, Padre Pio's words were fulfilled. On October 16th, 1964, the Madonna again visited Rosa in a public manifestation above a pear tree in Rosa's garden. The Madonna entrusted Rosa with a very important mission. "I will come always - the Eternal Father has promised me this - every Friday while my 'instrument' is alive. Then I will come every first Friday of the month until the end of the world"
"My little one, I come from very far away. Announce to the world that all must pray, for Jesus can no longer carry the Cross. "I want all to be saved, the good and the bad. I am the Mother of Love, the Mother of all - you are all my children. That is why I want all to be saved. This is why I have come: to bring the world to prayer because the chastisements are near." "I will return each Friday and I will give you messages and you must make them known to the world." Rosa replied: "But how will they believe me? I am only a poor ignorant peasant. I have no authority. They'll throw me in prison." The Madonna says: "Do not fear, because now I will leave you a sign. You will see it, this tree will blossom." On that very day, the entire pear tree, already laden with golden fruit, burst into blossom! And this was the month of October! "I give a special power to my garden down here, this little corner of paradise, where I will dispense many Graces." Rosa then saw a yellow globe descend down to the spot where the Well was to be dug - in the garden by the pear tree. Other witnesses present saw the same yellow globe. Rosa also saw a flame. The Madonna then told Rosa that Miraculous water would rise from this well and would be the source of many spiritual and physical blessings. She said: "Everyone will receive grace, strength, and some will even recover their physical health by using this Miraculous Water, because there will be no other water like it!" The Madonna then instructed St Michael to place his sword into the ground where the well was to be dug and instructs Rosa as to how deep the well was to be dug. "Dig further. Come to drink at this well of water of Grace. Wash yourselves! Purify yourselves! Drink and have confidence in this Water. Many will be physically cured. Many will become saints. Bring this water to those who are gravely ill in hospitals, to the dying. Go often to see the souls who are moaning. Be strong! Do not fear. I am with you. ... This is the hour when the well will give light. It is a confirmation. Come draw water and take it into your homes and you will obtain infinite graces." "This well will give Water to all generations, to all men. The more Water is drawn, the more it will yield. This is Miraculous Water." In another apparition, St Michael instructed that 10 Ave Maria's (Hail Mary's) are to be said when the water is drawn along with the Miraculous Madonna of the Roses prayer. In the book "Call of the Virgin at San Damiano" the author, Johan Osee recommends reciting 3 Hail Mary's and the Miraculous Madonna prayer before using the Miraculous Water and to add the Apostle's Creed when applying the Water topically. "Miraculous Madonna of the Roses, deliver us from all evil of soul and body." I believe in God the Father Almighty, Creator of heaven and earth; and in Jesus Christ, His only begotten son, who was conceived by the Holy Spirit, born of the Virgin Mary; suffered under Pontius Pilate, was crucified, died and was buried. On the third day He arose from the dead and ascended into heaven. He is seated at the right hand of the Father; from thence He shall come to judge the living and the dead. I believe in the Holy Spirit, the Holy Catholic church, the Communion of Saints, the forgiveness of sins; the resurrection of the body; and life everlasting. Amen. Our Father, who art in heaven, hallowed be Thy name. Thy Kingdom come, Thy will be done on earth as it is in heaven. Give us this day our daily bread, and forgive us our trespasses; as we forgive those who trespass against us and lead us not into temptation, but deliver us from evil. Amen. O my Jesus, forgive us our sins, save us from the fires of hell, and lead all souls to heaven, especially those most in need of your mercy. Hail Holy Queen, Mother of mercy! Hail our life, our sweetness and our hope! To you do we cry, poor banished children of Eve; to you do we send up our sighs, mourning and weeping in this valley of tears. Turn then, most gracious advocate, your eyes of mercy toward us; and after this, our exile, show unto us the blessed fruit of your womb, Jesus. O Clement, O Loving, O Sweet Virgin Mary! Pray each time before using the Holy Water of San Damiano (Miraculous Madonna�, Apostle's Creed, Lords Prayer, Ave Maria or other prayers). Then place 1 to 3 drops of the water in the mouth or apply topically and rub into the skin. For its spiritual and health benefits, do this one or more times daily. In acute conditions, use the water and prayers hourly. Miraculous Water - 2 oz bottle with dropper. Suggested donation $6.00. One bottle used 3 times daily (Total - 9 drops daily) will last about 3 months. May also be applied topically. Reprints of this 4 page brochure are furnished with each bottle. 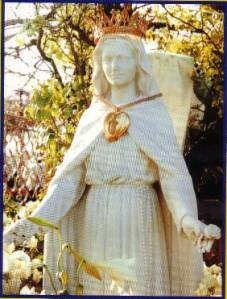 For rose petals and blessed cloths, it may be necessary to visit San Damiano, Italy, as our current supplies are either limited, out of stock or not available.